Villa Serena Blanca is in a wonderful central position, a mere 220 yards from the beach and a handful of beach bars in the laid-back resort of Cala Blanca. A small choice of shops can be found at the end of the street, with a larger choice of amenities 15 minutes' walk away, at the local commercial centre. The former capital, Ciutadella, is nearby too. The house has a south-facing private pool, BBQ and outside dining area, and includes air conditioning/heating in the bedrooms and lounge, plus WiFi. The villa is only a couple of minutes' walk from the beach and a choice of places to eat right by the sea! Outside, there's ample space to relax and sunbathe around the pool. The terrace is partly shaded providing a cool, comfortable space to dine, and the brick BBQ, by the poolside, is perfect for enjoying tasty homecooked dishes. The living area has large sliding patio doors opening onto the pool terrace, keeping the villa light and airy. There's comfortable sofas around the flat screen TV and a table and chairs. The adjacent kitchen is well-equipped, and has traditional wooden units and tiling, with windows overlooking the pool. There's a twin bedroom and bathroom on the ground floor. Upstairs is a twin bedroom and a double bedroom sharing a spacious terrace which overlooks the pool terrace below, and a separate bathroom. All 3 bedrooms are comfortable and well-furnished, with ample storage space. Tourist Licence Registration: HT 216 ME. Villa Serena Blanca is in a superb location. The house sits 2 rows back from Cala Blanca Beach, as well as a selection of restaurants with seating right on the seafront. Plus, for a greater choice of places to eat, drink and shop, it's a pleasant 15 minute walk through the resort to the local commercial centre, where some of the bars have fantastic sunset views at night. You can also catch a local bus or taxi into the former, historic capital of Ciutadella. There's a cafe and shop selling food, gifts and beachwear at the end of the street. A short walk past the beach is Cala Blanca's commercial centre which has more choice of places to shop. If you're looking for anything more than souvenirs and beach accessories, you can drive or catch the local bus into Ciutadella. The town has a lively market selling everything from local produce to clothing, shoes and jewellery, plus there are many chic boutiques to browse in the centre and along its winding side streets. The cafes and restaurants around the beachfront are only a couple of minutes' walk away, where you can relax over lunch on the dining terraces overlooking the sea. A short walk past the beach will bring you to Cala Blanca's commercial centre which has a greater choice of restaurants, cafes and a few bars too. The restaurants at the far end of the centre sit right on the seafront, and dining here in the evening is a must - the sunsets are spectacular! Cala Blanca Beach is practically on your doorstep. Sunbeds can be hired in the summer, plus the shallow water makes it ideal for younger children and snorkelers. If you do choose to hire a car, there are a couple of great alternative beaches within a 10 minute, just past the commercial centre, if you fancy a change of scenery. Cala Santandria Beach has a couple of restaurants, whilst the beach at Sa Caleta has a small snack kiosk, so it may be better to pack a picnic. Overlooking the beach, along the street running parallel to Villa Serena Blanca, is a snack bar with 2 small waterslides for children. Plus, several of the hotels around Cala Blanca offer evening entertainment, open to the public, and there's also a small lido with regular events for children. Anyone who does decide to hire a car will also be able to visit the zoo, or any of the islands waterparks (the nearest being 10 minutes' drive south in neighbouring Calan Bosch). The former historic capital, Ciutadella, makes a great day trip and is easily reached by car, taxi or local bus. The town has a huge number of boutiques and shops, as well as restaurants, some overlooking the harbour - another great place to watch the sun set! The town also has some impressive architecture and stunning historical houses that are open to the public. On the far side of Ciutadella is the Lithica sandstone labyrinth and gardens. The maze is huge and provides plenty of fantastic photo opportunities! It also gets very hot so it's best to visit on cooler days or during the evening. Further afield you can venture up to Monte Toro, Menorca's highest point, and admire the view, or visit the restaurant and gift shop. Menorca's only golf course is in the resort of Son Parc, around 40 minutes' drive away. The course has a full 18 holes as well as a driving range, tennis courts and an impressive club house restaurant with a dining terrace overlooking the fairway. There is a scuba diving centre as well as basic water sport facilities by the beach throughout the summer. Or, if you prefer to keep your feet on dry land, you can enjoy a stroll along the Cami de Cavalls bridle path which encompasses the entire Menorcan coastline. Don't forget your camera, as the views over the sea from the pathway are spectacular! Villa Serena Blanca is not available to book for season as it is sold out. Take a look here at the Menorca villas that are currently on sale. Beds very comfortable, the area was very nice with a lovely beach - our first visit to Menorca. We were at the same villa last year and returned again this year. Our Rep Dionne was amazing and came to help us out on a few occasions. She was very friendly and would do anything to help. The villa is nice and has everything you need and that's why we returned. We had a great holiday. Really enjoyed hols in villa, everything what we wanted was here. Pool lovely and warm, pool table is a nice change. Resort nice with some great food. A very enjoyable holiday and am looking to book again for next year. Second year we have been to same Villa in this resort, it was a lovely holiday yet again. Lovely spacious villa, overall lovely holiday, 2nd time with Villa Plus. A lovely villa in an ideal location. Everything we needed inside. The villa overall was excellent. Everything was clean and in good condition. 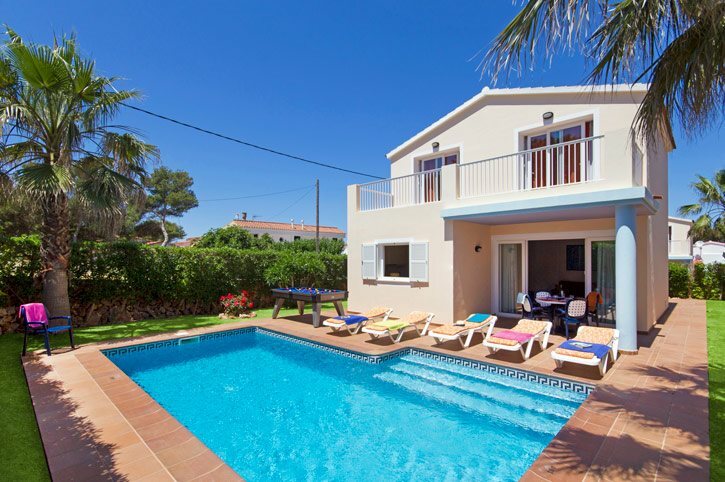 The villa was ideally situated to the beach and in a lovely area and the transfers to and from the airport were excellent. We could not fault villa plus. A definite to use in the future and to recommend.